When most people talk about peppers, they are referring to the hot, spicy, or chili variety. But there is a whole other type of pepper that can be used in a variety of ways to help fill your family’s plate. Bell peppers, which come in a variety of colors, are very versatile and offer a great way to add some color and crunch to your everyday dishes. In Arizona, we grow lots of this wonderful pepper throughout the state. Bell peppers, which are also called peppers and capsicum in different parts of the world, come in a variety of colors including green, red, orange, brown, purple, white, and yellow. The difference in color is sometimes related to the level of ripeness. For example, green peppers are just red peppers that have not yet completely ripened. Different coloring equates to different flavor. Green peppers are the most bitter and red peppers are the sweetest. Yellow and orange are in the middle, less bitter than green but not as sweet at red. The way peppers are ripened also affects their flavor. Vine-ripened peppers are the sweetest while those that are harvested and then allowed to ripen cannot achieve the same level of sweetness. Although they are part of the Capsicum genus, they are the only member of that family of plants that do not contain capsaicin, the chemical that makes other peppers hot and spicy. Because they lack heat, bell peppers are also often called sweet peppers. The lack of capsaicin in bell peppers is caused by genetics; a recessive gene causes these peppers to grow without it. Although bell peppers are technically fruit, they are widely considered to be vegetables. 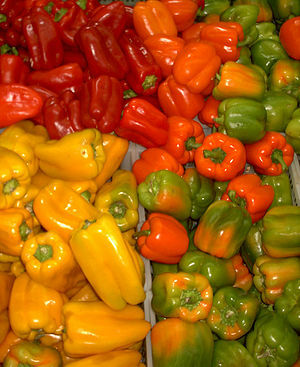 China is the largest producer of bell peppers today, followed by Mexico and Indonesia. Although peppers are native to Mexico and parts of Central and South America, they are now grown all over the world. The bell pepper is said to have gotten its name from Christopher Columbus, who was the first to bring it, and its hotter cousins, back to Europe from the New World. Because most members of the capsicum family are hot, Columbus called them peppers after the peppercorn plant native to India. When it comes to nutrition, red peppers are better than the rest. While all peppers are low in calories and high in Vitamin C, red peppers have twice as much as green and three times that of orange. Red peppers are also higher in lycopene and carotene, important antioxidants, than the other peppers. Peppers can be added to almost anything for a burst of color or a crispy crunch. From soups and salads to sauces and salsa, bell peppers can enhance almost anything. Here are some great ways to get these veggies into your everyday eats. This entry was posted in Food Facts and tagged Arizona, bell pepper, Capsicum, Christopher Columbus, Coleslaw, Cook, Fill Your Plate, food facts, Mexico, New World, Salad. Bookmark the permalink.